Just as it proved to be earlier in the season, Oulton Park proved to be a successful stomping ground for Team #109 this weekend as the Bennetts British Superbike showdown kicked off, with both Eunan McGlinchey and Kevin Keyes both managing to make it onto the podium across the weekend. 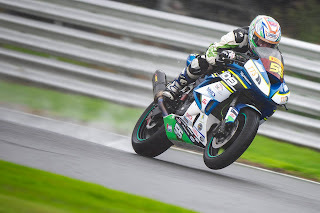 The weekend got off to a fantastic start for Dickies Junior Supersport championship leader McGlinchey, topping Friday’s free practice session by over two seconds in the damp conditions, finishing ahead of his title challenger Brian Hart. 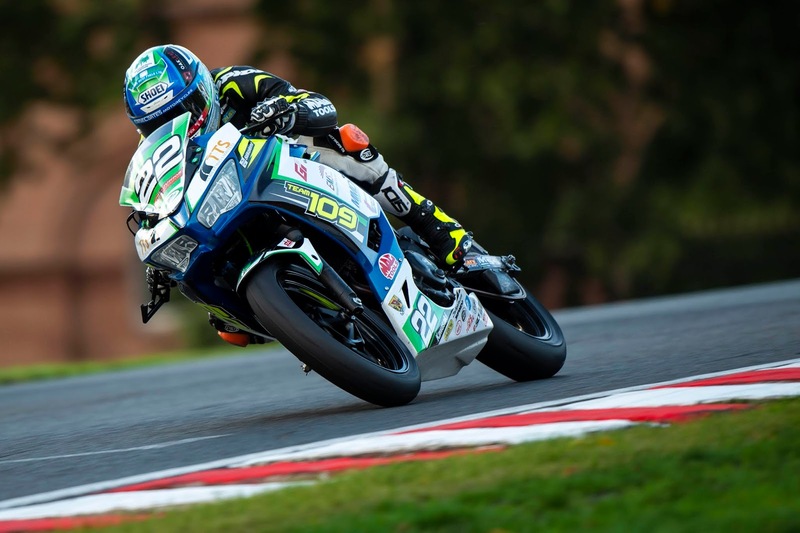 Qualifying proved difficult for the twenty-year-old from Aghadowey, finishing the session in seventh, which meant he would have to start the opening race of the weekend from the front of the third row. As the lights went out to start the first of his two races, McGlinchey set about passing a number of riders on the opening lap, making up for his third tow start. With a gap of almost four seconds to Hart in the lead, victory was looking like a task too far for the series leader. But as the laps ticked by McGlinchey was eating into the KTM riders lead by almost a second a lap, before making his move on the penultimate lap and taking the lead. Holding off Hart’s attempts on the final lap, McGlinchey crossed the line to take an incredible victory and extend his lead in the series by another five points. As a result of taking the win, it gave McGlinchey the opportunity to wrap up the championship in Sundays second race, with another victory proving enough to wrap it up. Starting from pole position, a three way breakaway group at the front, consisting of McGlinchey, Hart and Elliot Pinson battled it out for the victory throughout. As they began the last lap of the race it was all still to play for, and as they three entered the final corner McGlinchey went for the lead, and what would have been the title, but a slight mistake exiting the corner saw him slip back to third behind Hart and eventual winner Pinson. Despite not claiming the championship title on the day, the Aghadowey rider enters the final round of the year at Brands Hatch in pole position to take the crown, with a forty-three point advantage back to Hart in second, and looks in good position to claim a British championship in his debut season, and what would also be the first for Team #109. In the Pirelli National Superstock 600 class Kevin Keyes had one of his most consistent weekends this season, setting a solid pace early in the weekend, finishing inside the top five in both a dry free practice one and a wet free practice two on Friday. Sitting inside the top ten throughout all of qualifying on Saturday morning, Kevin went out for a final stint in the closing few minutes, and a great lap saw him jump onto the front of the second row, finishing the session in an excellent fourth position. In what was an incredibly wet race on Sunday afternoon, Keyes started the race smoothly, running as he had done all weekend inside the top five. As the race reached its halfway point Keyes began to close the gap to the riders ahead, passing firstly Joe Sheldon-Shaw, before having a great battle with Milo Ward for the final spot on the podium. As they entered the final few laps Ward was unable to reply to Keyes’ move for third, and despite the horrible conditions at the Tarporley track, Keyes brought the Team #109 Kawasaki ZX6R across the line in an excellent third position, matching the result he scored at the first Oulton Park event back in May. A delighted Team #109 team manager Paul Tobin commented on his riders performances over the course of the weekend saying; “We had a good setting for Kevin all weekend and when things are right for him he can push. He had a good qualifying that put him fourth on the grid for the race. The team done a fantastic job as it was all hands on deck when we had less than five minutes until pit lane closed to get the bike from full dry settings to wet. Kevin goes well in the wet and proved that again in the race, a great podium and just rewards for the teams hard work all weekend”. 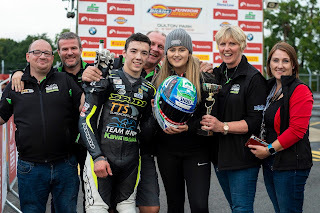 Riding the second Team #109 Kawasaki Ninja 400 under the McManus racing banner, fifteen-year-old Eoghan James McManus unfortunately had a difficult weekend at the Tarporley track in what were incredibly difficult conditions, suffering two crashes in the two Dickies Junior Supersport races. Team #109 Kawasaki would like to thank our sponsors for their continued support; TTS Surfacing, MMD Construction, EMS Copiers, Cork Motorcycle Racing and Vintage Club, LiftRite Ltd, Spears Racing, Fuchs - Silkolene, R&G Racing, Kawasaki UK, Ohlins Racing, HEL Performance, Glenn Irwin GI2, J-Tec Sports, SBS Brakes, JOG Tuning, Shoei Helmets UK, Feridax, James McCann Photography, Gorman Crash Repairs, Jim McCann & Sons Family Butchers, Unlimited Industries, MSS Performance, and Ross Motorcycles Cork.